On 29 June 2014, I will be blessed to travel for the second time to the Holy Land with members of the Catholic Women’s League (C.W.L.). We are visiting Israel and Palestine for nine days on a spiritual pilgrimage and to learn about local Christians and Christian organizations. The Catholic Women’s League of Canada has about 90,000 members in parishes all across Canada. Through the initiative called Velma’s Dream, they are currently supporting two projects in the Holy Land: the Infant Welfare Centre in Jerusalem and Shepherd’s Field Hospital near Bethlehem, both of which we will be visiting. Velma Harasen, former national president of the C.W.L. and namesake of “Velma’s Dream,” will be accompanying us. Ms. Harasen also came with us last year. Her vision is to encourage the Catholic Women’s League to continue to support the poor in the Holy Land. Our group also includes Betty Anne Brown Davidson, the current C.W.L. national president; Carl Hétu, CNEWA Canada’s national director; the Rev. Vincent Pereira of the Archdiocese of Ottawa; and participants from as far west as British Columbia and as far east as Quebec. I look forward to this exciting trip, as we walk in the footsteps of Pope Francis, who made a recent pastoral visit to the Holy Land in May. The Holy Father encountered local Christians, prayed with them and lovingly listened to their stories. We will post an update on the blog during our trip, so stay tuned! Learn more about Velma’s Dream on our website. In this image from last fall, a woman in Lebanon clutching a rosary prays for peace. Elizabeth Scalia, the managing editor of the Catholic portal at the spiritual website Patheos, asked me to share some thoughts with her readers about the worsening crisis among Christians in the Middle East. As the artificial geopolitical construct that is the Middle East collapses, millions of lives are altered irrevocably and indiscriminately each day: young and old, male and female, city sophisticate and nomadic shepherd, Sunni and Shiite, Arab and Armenian, rich and poor. In Iraq and Syria — by far the largest states in the region created by the Western Allied powers after their victory in World War I — the pressure cookers once controlled by strongmen have exploded, unleashing violent forces so extreme even Al Qaeda has repudiated the bloodletting. Iraq — once awash in cash thanks to its oil reserves — has disintegrated, its people exhausted by more than 25 years of constant war. Syria — once the bedrock of regional stability — has crumbled, its people displaced and maimed. Meanwhile, extremist militias overrun vast swaths of devastated territory to restore an Islamist empire akin to those that dominated the region for centuries. Middle East Christians bear the brunt of these brutalities. Though descendants of those who first received the Gospel almost 600 years before the advent of Islam, Christians are perceived by the extremists as imports from the West and, therefore, as enemies of Islam. Spread from Egypt to Iraq, and numbering no more than 15 million, Middle East Christians possess neither powerful allies supplying arms, nor an exclusivist ideology capable of rallying and uniting a diverse community with distinct traditions, rites and histories. And so to survive, Middle East Christians do what they have always done during similar waves of violence in their long history: they head for the hills. Observers describe the current wave of violence in the Middle East, and the flight of its minorities — especially its Christians — as an existential threat. Can the Middle East survive without its Christians and other minorities? Sure, but can a region thrive though overwhelmed by extremist ideologies at odds with mainstream Muslims? Check out Elizabeth Scalia’s blog, The Anchoress, for more. To help Iraq’s besieged Christians, visit this page. And remember them, please, in your prayers. CNEWA has just learned that the situation in Qaraqosh, Iraq, is critical, that all 50,000 people have been evacuated and that the Syriac bishop there is negotiating between two sides for his people. Thousands of Iraqi Christians arrived in Kurdish-controlled areas on Thursday after Islamist militants attacked one of the last Christian enclaves in country. A staff member from the International Organization for Migration said that between 2,000 and 3,000 people arrived Wednesday night and Thursday morning at a converted youth centre in Ain Kawa, a Christian town on the outskirts of the Kurdish capital of Erbil, that was serving as a temporary refugee-processing hub. Thousands of other Christians were reported to have sought protection with local families in Erbil and other Kurdish cities. The refugees were fleeing an attack by the extremist Islamic State in Iraq and the Levant on Qaraqosh, an historic Christian town outside the city of Mosul. In recent weeks, The Sunni extremist ISIL has made stunning advances in Iraq, seizing the cities of Mosul and Tikrit, as well as border crossings to neighbouring Jordan and Syria, as it pushes towards Baghdad. ISIL is supported by remnants of the Baath Party of former dictator Saddam Hussein, as well as many local Sunni Muslim tribes opposed to the Shia-dominated government of Prime Minister Nouri al-Maliki. Qaraqosh residents and Kurdish officials say ISIL attacked Qaraqosh — which had been under the joint protection of Kurdish peshmerga fighters and local Christian militiamen — late Wednesday night. Although the attack was apparently repulsed, several mortar rounds landed in Qaraqosh, a town of 50,000, provoking a mass exodus. Until Wednesday, Qaraqosh had been seen as a safe haven for Christians fleeing violence and persecution in Mosul and other cities. Many residents had moved there following a wave of murders and threats targeting Mosul’s Christians in 2008. 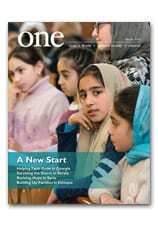 We reported extensively on the plight of Christian refugees in northern Iraq in ONE in 2011, in our story A New Genesis in Nineveh. Please keep the suffering people of Iraq in your thoughts and prayers. You can also help them with a tangible gift that can help bring medicine and equipment to those in need. Visit this page to learn how you can make a difference today. But look closer, especially along Mount Auburn Street, another of Watertown’s major thoroughfares. There you will find the offices of lawyer Ara H. Margosian II and optometrist J.C. Baboian, the Bedrojian Funeral Home and the St. James Armenian Apostolic Church. Armenian flags — tricolors of red, blue and orange — fly above filling stations. There is a cluster of specialty groceries, all more or less like the Sevan Bakery, which advertises “Fresh lahmejune daily” and displays a list of available dips: hommus, babagounesh, muhammara, yalangy, tabouleh and tarama. You would think Watertown, population 33,000, was founded by a group of Armenian gourmands, not 17th-century English settlers. Like other immigrant communities, the 50,000 Armenian-Americans in the Boston area are bound together by several cultural factors. There is of course religion. In Watertown alone there are four Armenian churches — two Armenian Apostolic, a Catholic and an Evangelical — and several more within a short drive. There is also language, though this cultural glue is weakening as Armenians followed the historic assimilation patterns of other immigrant groups. And there is politics, particularly the galvanizing efforts to raise awareness about the Armenian genocide, which many believe has been an overlooked tragedy of the 20th century and one that Turkey has never fully acknowledged. Food might seem a less lofty social glue, but nonetheless it may be the most enduring. After all, very few drive to Watertown from New Hampshire or Vermont to attend a political rally or a Sunday liturgy. But they do come, and in droves, to stock their pantries and freezers. Margaret Chauushian and her husband, Gabriel, bought the Sevan Bakery 22 years ago, five years after they moved to Watertown from Istanbul. The store is dominated by a long salad bar — actually, a salad bar that has been converted into a depository of dozens of different nuts: almonds, cashews, peanuts, toasted or fresh, unsalted or salted. In the back, several men and women were making fresh lahmejunes — a thin, spicy pizza — for which the bakery is best known. The store caters to Watertown’s 7,000 Armenian-Americans, Armenian-Americans who drive in from near and far and non-Armenians who have developed a taste for the food. Read more about where you can get A Taste of Little Armenia in the July 2006 issue of ONE.